Through games of Feb. 15, Giannis Antetokounmpo was the 3rd best player in the NBA behind only James Harden and Anthony Davis, according to Basketball Impact and Efficiency (BIER) positional ratings. Lebron James and Steph Curry rounded out the Top 5. No one should be shocked and awed by these revelations, as the top spots in the BIER Rankings merely confirm what you and me and even casual NBA fans already know, while also confirming that BIER’s a reliable box score stats model that works. (For an explanation of BIER go to the BIER Basics page, wherein the thorny question of whether or not the world really needs another advanced box score metric is also addressed, formula included). The All-Star break made for a good stopping point for the compiling of things, so I found some time to crunch the 2017-18 season BIER numbers for every NBA player, then created a relative scoring system by position to rank the top 60-70 players (expressed as “median +”). 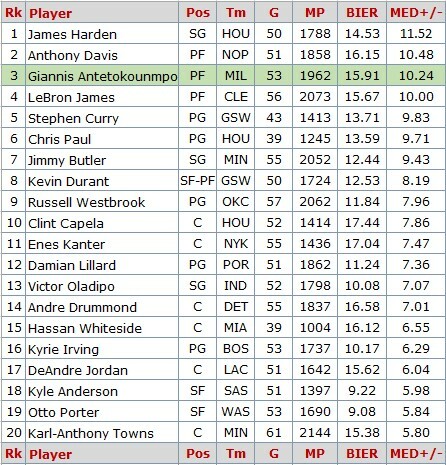 For example: Giannis has a BIER rating of 15.91, which is 10.24 above the median (5.67) for all power forwards. James Harden‘s rating is actually lower (due to missed shot volume and turnovers) but because the median for shooting guards this season is 3.005, he comes out on top in this “relative” ranking system at 11.52. The non-centers in the first 16 are another affirmation that this BIER thing is no crackpot system — from Harden to Irving, the fans, players and coaches got the easy 12 All-Stars right, noting that Chris Paul didn’t make the mid-season party due to missed games (injury) earlier in the season. 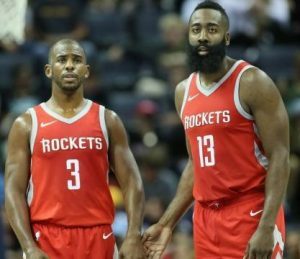 Chris Paul (left) and James Harden have their sights set on the Warriors’ Western Conference title and a shot at winning it all this season in Houston. USA Today Sports photo. License: Standard non-commercial use. 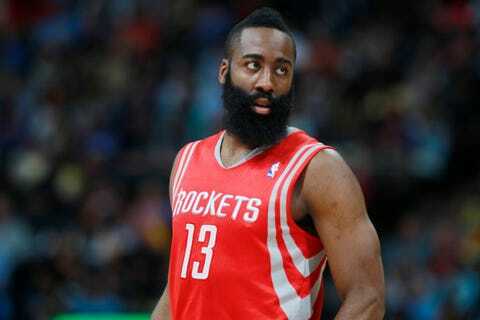 James Harden will, in all likelihood, win the MVP this year and deserve it. A 14.53 BIER for a shooting guard is the territory of Michael Jordan, the only SG in history to record a career BIER greater than 14. That Harden doesn’t shoot as efficiently as Jordan hardly matters when the Beard is doing so much of everything else in the box score, and the Rockets have won 17 straight. Harden’s 38% from three is the best he’s shot it since his 2012, his last year in OKC. 2. Anthony Davis edges out Antetokounmpo with better free throw shooting, offensive rebounding, blocked shots (leads the NBA) fewer turnovers (the Brow doesn’t play point forward) and fewer fouls. Since I crunched these numbers, the Pelicans have won 7 straight and Davis has gone for 40+ points in three of the wins. Giannis and the Bucks have won 2, lost 6, and fallen to 8th in the East, though Giannis has been good enough to stay in the league’s top 5 or 6 rated players. 4. Lebron James, at age 33, is averaging 26 pts, 9 boards and 8 assists per game, feats that a 33-year-old Larry Bird nearly matched (24.3 pts – 9.5 rebs – 7.5 assists) — and Lebron is showing no signs of slowing down. The Oscar Robertson for modern times, however, turns it over a lot (4.3 per 36 – BIER is a per minute, pace adjusted model) and doesn’t rebound like the Brow or the Greek Freak. Those factors tend to offset his greater assist rate in the BIER rating. All three forwards were shooting 54% from the field at the break. 5. Steph Curry laid a little low last season as he worked to integrate Kevin Durant into the Warriors offense, but Steph’s back to MVP form this season, shooting just one FG% point shy of the 50-40-90 Club — and how does he manage nearly 6 boards a game? 6. In Houston, Chris Paul has quietly gone about his business (except for that craziness with in the Clippers locker room), and the business of Chris Paul is to file top 5 All-Time BIER point guard numbers. CP3 is right there with John Stockton at No. 2 behind Magic Johnson, which means that Curry isn’t far behind on the All-Time list. “Seventh? That can’t be right.” Jimmy Butler‘s having another great season, reunited with coach Thibs. T-wolves photo. License: Standard non-commercial use. 7. 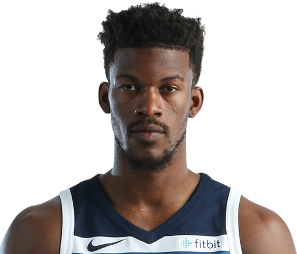 Jimmy Butler‘s career NBA offensive rating is 10th All-Time (118.85/100), believe it or not, and 3rd among active players (behind Paul and DeAndre Jordan). 8. Kevin Durant is shooting 43% from three, but he’s a bit off this season — his true shooting percentage is down .04 points, from 65.1% to 64.7%. The numbers being filed by these top 9 players are unreal. (9. Russell Westbrook gets a full discussion in the “BIER Basics” post). 10. Rockets center Clint Capela represents part of the Frankenstein model for centers in the new NBA — “Frankenstein” because no player possesses all the many attributes found in the crop of young centers. Capela is quick, athletic, mobile enough to guard the 3-point line, a shot-blocker, rebounder and dunker of many lob passes — which means he doesn’t miss many shots. BIER loves that. Basketball-reference had a stat the other day about how Capela this season will become the youngest player in NBA history (age 23) to record a double-double season while shooting 65% or better. He also blocks 2.4 shots/36, 3rd among qualifying centers. (Capela also represents the part of the new NBA center model where the center doesn’t play full-time minutes, though he does qualify to be ranked here. The minimum qualification for BIER ranking is playing time of 25 mins per game, with a case-by-case minimum on number of games due to the crazy number of star players getting hurt this season). 11. Thought the Knicks most impactful player was Kristaps Porzingis? Nope, that guy is Enes Kanter, who’s been a high-efficiency brawler in the offensive paint in New York (his 5 OREBs per 36 is 3rd among NBA centers). Porzingis, despite the NY media glow and All-Star politics, won’t make the lists here, which should tell you there was a reason the Knicks weren’t winning before “the Unicorn” had season-ending knee surgery. 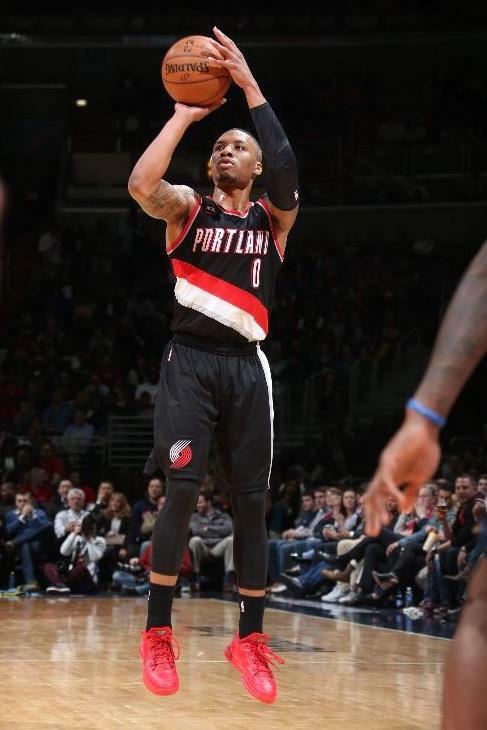 2017-18 has been Damien Lillard’s finest season, according to BIER. 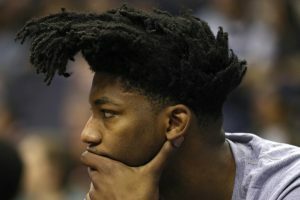 NBA.com photo. License: Standard non-commercial use. 12-13. 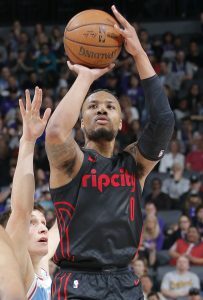 But let’s talk about the players who are on the list, like Damian Lillard, on fire of late and having his best season as a pro in Portland, according to BIER; and Victor Oladipo, having a breakout year leading the NBA in steals and the Pacers into the hunt for top-4 playoff seeding in the East. 14. Pistons center Andre Drummond edges out Hassan Whiteside of the Heat, and it’s not all about offensive rebounding, though Drummond leads the league on the O-glass and overall rebounding; it’s also about Drummond’s better passing and his theft rate. 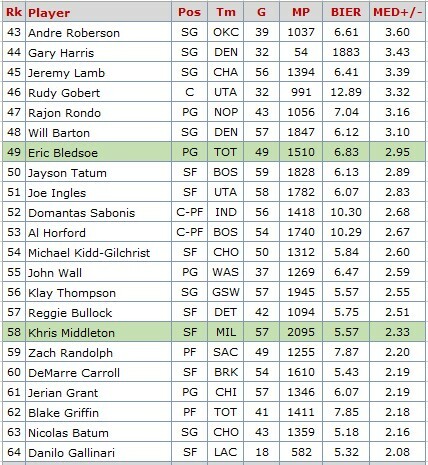 Drummond leads all qualifying centers in steals per 36 mins (1.7) and his assist rate is double the median for centers. So despite not having quickness, mobility or great shot-blocking ability (like Capela), Drummond has an all-around floor game that any box score-based stat model would love. 15. Whiteside is all of the above as an imposing defender and rebounder but doesn’t have all-around offensive skills like some “new centers.” Based on Miami’s winning ways in January, Whiteside probably would have been an All-Star had he not missed 18 games earlier this season, though who knows — the East coaches might’ve snubbed Whiteside too, as they did with Drummond in the first-seven reserves voting. Heat point guard Goran Dragic was selected. 16. Surprised that Kyrie Irving — who’s flirting with 50-40-90 Club shooting season and would be the 8th player in history to join that club — isn’t ranked higher? Irving has thrived in Boston, but it’s not as though he’s transformed into a wholly different player. Other point guards, even Lillard, pass the ball more, as Irving’s assist rate is about the league median for PGs (5.5 per 36). 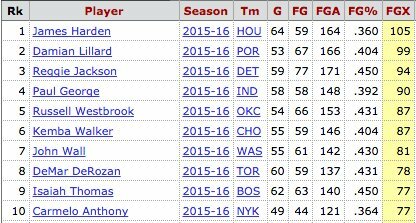 Irving this season is well ahead (at 10.17) of his career BIER rate (8.49). 17. DeAndre Jordan, in his 10th season Clippers, may not have the quickness to defend the perimeter (again, like Capela) but he can dunk a lob pass like nobody’s business. 10 years in Lob City have put Jordan on the Top 20 All-TIme BIER center lists, and he’s quietly had another great year as L.A. battles down the stretch for a playoff spot. The rebounding numbers for Jordan, Drummond and Whiteside are off the charts – all three centers board at nearly 17 rebs per 36. Ridiculous, but also a reflection of the all-time low offensive rebounding rates in the NBA this season. Crashing the offensive glass is a feature of bygone days in the NBA, which has made defensive rebounding a lot less like work for the better big men. Is it the player or the system? 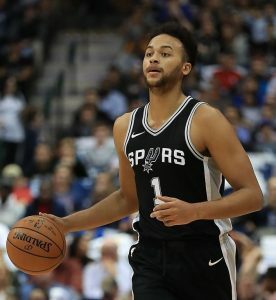 Whichever it is, Kyle Anderson of the Spurs made the BIER Top 20 at the All-Star break. Photo by Ronald Martinez, Getty Images. License: Standard non-commercial use. 18. Who is Kyle Anderson? He’s the 24-year-old forward for the Spurs who’s been starting in place of injured Kawhi Leonard (shoulder). Anderson doesn’t shoot a lot (8 times per 36 mins) but hits a high percentage (51%), and rebounds the small forward position like it was the 1980s (7.5 per 36), while dishing out 3.6 assists and coming up with 1.8 steals/36 (2nd among SFs). He’s filling up the box score without turning it over or fouling a lot — all of which has him in the Top 20, sneaking in just above the 25 minutes per game requirement. But there’s always the nagging question for the Spurs’ small forward — is it the player or the Popovich system? 19. Otto Porter is a super-efficient shooter at forward (49-40-84%) and one of the reasons the Wizards kept winning when John Wall went down with a knee injury at the end of January. In his 5th season, Porter’s a strong wing defender who rebounds his position (7.3 per 36) and has the 3rd-best SF steal rate (1.8/36). In the Wizards recent win in Milwaukee, Porter stole the ball three times while turning it over 0 times. The 0 turnovers were no happy accident — he rarely turns it over, just once per 36 mins while playing catch-and-shoot with the Wizards All-Star guards. Porter is averaging a career best 15.1 pts per game this season. 20. Karl-Anthony Towns is one of the few centers in the league actually making a high enough % of his 3-point attempts to be out there shooting them. Towns was shooting 55-42-86% on FGs-3pt-FTs at the All-Star break and his numbers have actually improved slightly since then. No center in the history of the NBA has shot the ball from the outside as well as Towns, who is only going to get better. That’s the Top 20, and here’s the next 20, where the BIER calculation didn’t fail to produce some surprises. Orlando traded Elfrid Payton to Phoenix for a 2nd round pick, even though he’d found ways to minimize his poor outside shooting while maximizing the rest of his game. Photo by Zimbio. License: Standard non-commercial use. 23, 31. Elfrid Payton and Rondae Hollis-Jefferson ahead of All-Stars like Paul George, Bradley Beal and Kemba Walker? They play NBA games in Orlando and Brooklyn, and there are some young players on those teams filling up box scores and finding their games. The BIER formula does what it does. Payton was easily the biggest surprise for me. The Magic traded him to the Suns last month for a 2nd round pick, so I wasn’t at all expecting him to show up here. The problem with Payton (all pause to marvel the work of his hair stylist) is that he can’t shoot. But unlike a lot of guys who can’t shoot in the NBA, Payton has figured out how avoid throwing up bad shots. He shoots 50%, has made 35% of his threes this season, and — as a taller point guard — has high rebound and assist rates. Orlando just didn’t want to pay him this summer after his 4-year rookie contract expired, but Phoenix might be a good fit given the young guns on the Suns. 22. BIER says Ben Simmons of the 76ers should win Rookie of the Year (and he probably will), averaging an all-around 16.9 pts – 8 rebs – 7.6 assists/36. 24. Darren Collison is having a break-out shooting season for the Pacers and is the 3rd point guard in the rankings flirting with a “50-40-90 Club” season. With Oladipo at No. 13 and Collison at No. 24, suddenly the Pacers have one of the most efficient and impactful backcourts in the league, so far rating better than Derozan-Lowry, Wall (injured)-Beal and Lillard-McCollum. 25-39. From there we see a string of All-Stars (eight in all) led by Demar Derozan (25), having another great season in Toronto, his running mate Kyle Lowry (27), and Kevin Love (28). I wouldn’t classify Love as a center, so I split the difference making him a half-center, half-power forward. This was probably not the thing to do, technically, as basketball-reference has Love playing center 98% of the time. But K-Love hasn’t changed his game with his new role — 40% of his shots were threes (before another injury sidelined him). I also split the difference with Draymond Green, who alternates between power forward and small forward with Kevin Durant (also spit). This was the right thing to do, technically. Few teams actually play “positionless basketball” but the Warriors forwards truly are interchangeable, with Green often playing point forward a la Lebron and Giannis. 29. Tyreke Evans in Memphis got back to the 20-5-5 numbers he put up when he beat out Steph Curry and Brandon Jennings for the 2010 Rookie of the Year award. Good numbers, though I can’t help but wonder if Evans will ever be able to put up those numbers for a team that wins games. 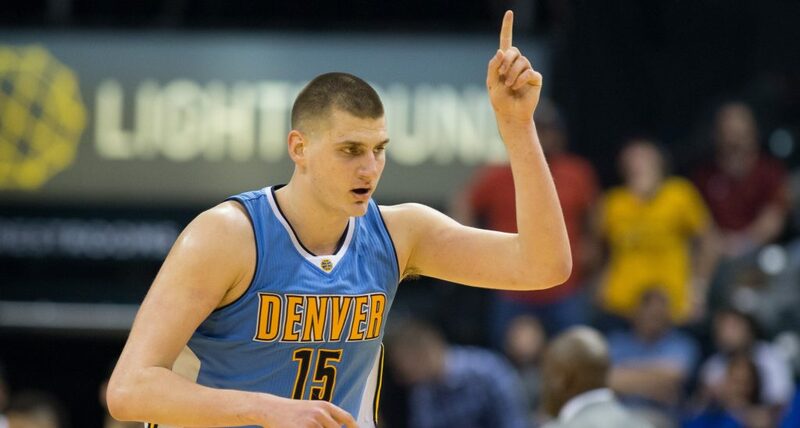 Nuggets center Nikola Jokic is No. 30 in the BIER rankings and joins the Clipper’s Lou Williams as the top Western Conference players snubbed in the 2018 All-Star selection. USA Today photo. License: Standard non-commercial use. 30. Nikola Jokic is another center to be reckoned within the new model, representing the 7-footers with mad guard skills. Jokic posted the fastest triple double in NBA history in Milwaukee just before the All-Star break and has all-around numbers at 16.9 ppg, 10.6 rebs and 5.9 assists per game. He’s also one of only a handful of qualifying centers shooting in the neighborhood of the NBA avg. of 36.1% behind the arc. The Joker was shooting 36.3% at the break. Al Horford, Towns, Love and Pau Gasol are the others, a list of 5 that looks a bit too forward-ish to really reflect a “centers shooting threes” trend, if making the 3-pointers has anything to do with it. (This is a topic begging for a separate blog). Jokic this season joined Lou Williams on the Western Conference All-Star snubs team. 31. In Brooklyn, BIER finds a player in the rough in Rondae Hollis-Jefferson, a steadily improving 3rd year forward who, if he ever learns to shoot the three (he’s hitting just 26% this season), could develop into a star given the strengths in the rest of his game. 35. 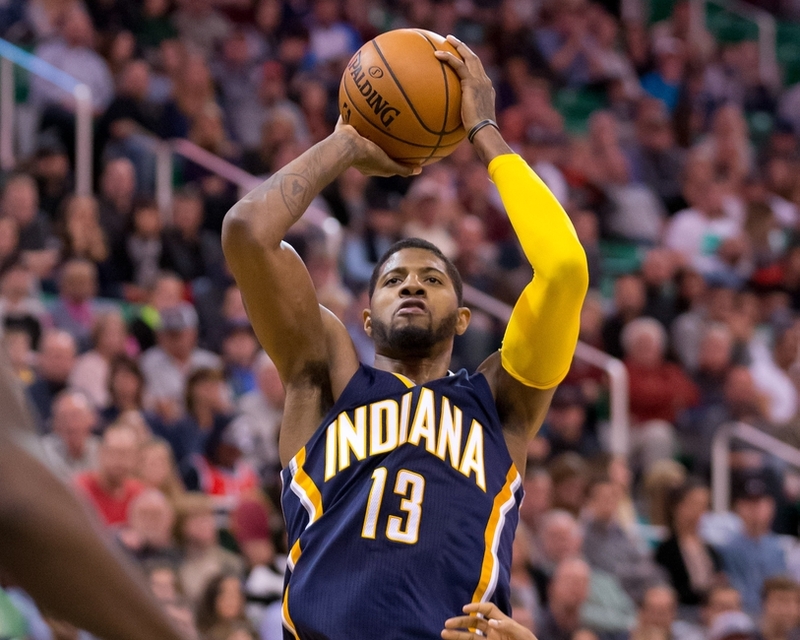 Paul George makes an appearance, and is Top 4 relative to other small forwards — and shooting 43% from three this season in addition to being one of the best defenders in the league. He was the 8th reserve All-Star selected by the West coaches, which BIER confirms was a fair choice. Never has a borderline All-Star received as much media attention as George does, however, and I think nearly every NBA analyst who’s seen Lou Williams (26) play lately has said that “Lou Williams should have been an All-Star”. BIER also confirms this, and Lou’s ahead of George at No. 26 in the BIER ranking. 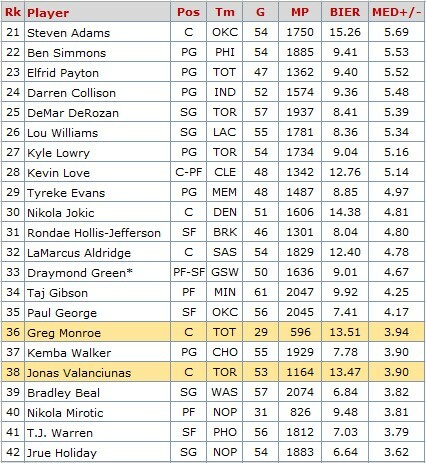 Two “dinosaurs”: Is Toronto center Jonas Valanciunas really shooting 44.6% from three and why is he on this list? Well, he’s not on the list really, and he’s taking fewer than one 3-pointer a game, so he’s not really on that list either, nor his he playing the minimum of 25 mins per game. I included both Valanciunas and Boston’s Greg Monroe (who also hasn’t qualified) because they have so much in common as so-called “dinosaur” centers — and their BIER numbers are so nearly identical — that it’s just interesting to have in the chart. At the end of the day, Valanciunas and Monroe are more efficient scorers and better rebounders than the vast majority of centers in the league; and when they’re in the game, they contribute big impact numbers despite their teams preferring to play outside-in. 40. Jrue Holiday closes out the Top 40, which makes a lot of sense in light of Holiday finding a next level to his game in New Orleans playing with Rajon Rondo and Anthony Davis in the absence of injured DeMarcus Cousins. Holiday’s averaged 21.7 pts and 7.6 assists since Cousins season ended Jan. 26, and he’s raised his 3-point shooting to 35% on the season. This entry was posted in BIER and tagged Advanced stats, Anthony Davis, BIER, BIER formula, Chris Paul, Clint Capela, Giannis Antetokounmpo, James Harden, Kyle Anderson, Lebron James, Otto Porter, Russell Westbrook, Stephen Curry on March 9, 2018 by J.D. Mo. The boos began as a smattering but became a steady chorus, raining down on the officials and the Spurs and Kawhi Leonard as he stepped to the free throw line with 10 seconds to go in the 1st half of Friday night’s Spurs-Rockets game in Houston. It wasn’t this shooting foul on Ryan Anderson that the Rockets fans were booing, or Leonard, really. It was a culmination of calls and non-calls made and not made in the 2nd quarter by the referees — five on the Rockets and two of them on star James Harden — but not a single call against the Spurs by refs Marc Davis and Brian Forte. This foul putting Leonard on the line was called by Forte. It wasn’t a terrible call. There was contact, not a lot, but enough, as Leonard pulled up for a jumpshot. But the Rockets hadn’t been getting calls like this, hell no, and Harden had been attacking the Spurs defense most of the half. And so the boos began. Although Forte had made the call, Harden approached Davis. It was Davis who had called two fouls on Harden, his 2nd and 3rd of the game, the last one on an odd, awkward play with 5:18 to go before halftime as Harden was shooting a three. Spurs center Pau Gasol had moved into Harden as The Beard shot, exaggerating his follow through to ensure that he got the call. But he hit Gasol in the head with his off hand, and Davis didn’t like it. An unlikely offensive foul on Harden. Harden couldn’t believe the call then, and didn’t still, so it was Davis whom Harden approached now as Leonard shot his free throws and the boos rained down. 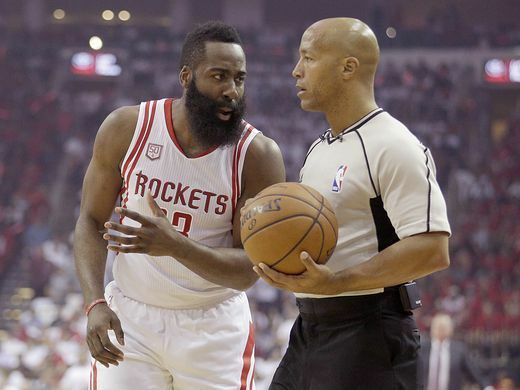 James Harden pleads his case to official Marc Davis during Game 3 of the Spurs-Rockets series Friday night in Houston, May 5, 2017. USA Today photo. Licence: Standard noncommercial purpose. Davis, the official who was the bane of home teams during the 2016-17 season, had done it again. He had the Houston crowd’s attention, Harden made sure of that in walking over to him. He had the players’ attention — the player as far as the Rockets go — and he had the focus of the cameras, ESPN’s and those on photographer’s row. He was part of the show, the character the fans love to hate, a foil written in to draw out the best and worst of the show’s stars. Not the ideal part, no, but no minor role by any means, and for the moment the man at the center of it all. Forte might not have been in the building as far as the Rockets crowd in Houston was concerned. While Harden pleaded his case to Davis, the ESPN broadcast team decided to help him out. They ran a series of low-lights showing Harden driving through the lane, taking hits from Gasol and other defenders but coming up empty. Harden wants the call on every drive to the basket, and in this game he is determined. Instead of retreating, he advances, demanding an official response. He’s put Davis on the spot in front of a hostile home crowd, precisely the place where Davis wants to be, based on the trend that emerges in games he referees. During the season, the visiting teams had a 35-30 record in games Davis officiated, a 54% win rate, a remarkable thing in a league where the home teams have won about 60% of the games, historically. The visitors fared better than the league average when Davis worked their games in 10 of the last 14 seasons, though never quite like this season, where the divergence from the norm was a whopping 24.4%. It hasn’t worked out that way in the playoffs so far, largely due to the Round 1 mismatches and the NBA not scheduling Davis to officiate a contender on the road until the Spurs-Rockets game (whether the Spurs remain a contender without injured Tony Parker is the question of this series). The Bucks on April 27 in Milwaukee were the first home team of these playoffs to fall with Davis as the ref. (See “More than a Slap on the Wrist (Part 1)“) The Wizards nearly had a road win with Davis as crew chief May 2 in Boston, but 2nd official Rodney Mott bailed the Celtics out by putting Isaiah Thomas on the line to tie the game with 14 seconds left. The Celtics won in overtime. Friday night in Houston, Harden and the Rockets were the home team feeling a pattern of injustice from Davis. Harden took the bait, and as the game wore on Davis drew more and more of the Beard’s attention, culminating in a technical foul on Harden in the 4th Quarter. Davis is notably more approachable for the players than many of the league’s longtime officials (Davis is in his 19th NBA season), a practice that helps build the drama for the spectator, but doesn’t do the protesting player much good. 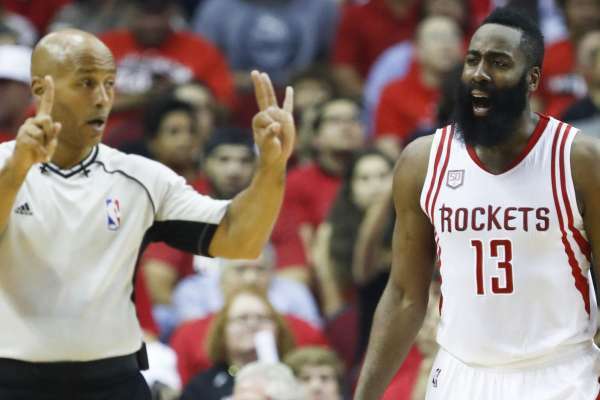 While Harden and the 3rd-worst referee in the NBA engaged in ongoing debate about how the game was being officiated, Forte was the ref making most of the calls against the Rockets. Whatever Harden was saying, it wasn’t helping. Entering the 4th quarter, none of the three officials had bothered to call a foul on Spurs center Gasol; and Harden had the same number of fouls (3) as Spurs stars Leonard, LaMarcus Aldridge and Gasol combined. Below is the breakdown of the calls in the game. Note that the average number of fouls called per team per game this season was about 20, and this has held true in the playoffs. Source: NBA.com, official play-by-play, Spurs-Rockets Game 3, 2017-05-05. The Spurs 17 fouls were below even their average of 18.3 per game. Forte, in his 10th NBA season, saw only two fouls on the Spurs through 36 minutes of play. No, not as bad as Davis was in Milwaukee (not a single Raptor foul called by Davis in the first 36:52 of the game), but a 9 to 4 disparity suggests a rather one-sided view of the action. Danny Crawford, a 32-year veteran who was named the best ref in the NBA in the LA Times survey, set an odd tone at the start of the game by taking two Rockets’ fast break baskets points off the scoreboard and calling a blocking foul on Patrick Beverley behind the play. He then put his whistle away, using it just twice more in the half. Crawford called the first fouls on all three Spurs stars, Leonard, Aldridge and finally Gasol in the 4th. If the officiating “game plan” was to “let them play” and not call touch fouls, it certainly worked for the Spurs. Davis was the most balanced in his calls, though most of them were called on the Spurs bench players and role players such as Danny Green and Dejounte Murray. The Davis-Harden story was about the non-calls as much as it was about the calls, and the three fouls on Harden in the first half. The Spurs were the No.1 rated defense in the league this season (103.5 pts allowed/100 possessions). If the refs are letting them play their physical, constant pressure defense with less scrutiny than even their usual low foul rate, they’re very difficult to beat, and it’s bound to frustrate the opposition. The Rockets, with the Spurs defense in their grills, didn’t shoot well enough to win this game or any game (36.4% a team), though Harden himself did (14-28, 43 pts). Yet despite the focus on the referees that clings to this game like a lingering doubt, it was all eminently watchable. The Spurs would go on to win, 103-92, taking a 2-1 lead in the series. They pulled away late in the 4th quarter by playing the most efficient offense either team had played all night (31 pts in the quarter), with Danny Green hitting two big shot threes. In the absence of Spurs injured point guard Parker, Patty Mills (Parker’s backup) and the Rockets’ Beverley were water bugs on a lake of hardwood, chasing each other all over the court in high speed bursts. Harden’s trials and tribulations were made-for-TV drama, and his determination was remarkable. He drove down the lane at every opportunity, whether he was getting the calls or not. no matter how much he was being hit near the basket. Whether or not this was good basketball or something else entirely is debatable, but with his teammates struggling to make shots (an arctic 18-60, or 30%), Harden kept the Rockets in it until late in the 4th, when the Spurs fired up a 9-2 run. The free throws capping the run brought Davis back into the picture, as he sent Mills to the line on a Beverley shooting foul with 2:38 to go in the game. It was Beverley’s 5th foul. The Spurs were up 94-82 at that point, and Davis’ call felt like the game clincher. Beverley turned his frustrations on Davis, and Davis hit him with a technical foul, the second on the Rockets in the quarter (Harden got the first). The Spurs made all three free throws, running the score up to 97-82 with 2:38 to play. By the final horn, 25.7% of the fouls called in the game had been called on two players, Harden (4) and Beverley (5), the guys doing the most to force the action and keep the Rockets in it. In addition to the nine fouls, each had a technical foul issued by Davis, bringing their foul share up to 11 of 37 total calls, which looks more than a little odd in a game where the other key players were allowed to play with minimal interference from the refs. The T’s marked the 4th game in a row for Davis in which he had called the only technical fouls in the game, going back to the last time Davis saw the Rockets, in Houston April 25. May 2 in Boston, Wizards-Celtics Game 2. Double technicals to Isaiah Thomas and Wizards PF Markieff Morris after a confrontation in the 3rd Quarter. April 27 in Milwaukee, Bucks-Raptors Game 6. Bucks coach Jason Kidd for arguing a missed slap call on a rebound and a blown charge-block call, both by Davis within 30 seconds of each other in the 4th quarter. Davis had called only one foul on the Raptors at that point, and that call was made 36:52 into the game. April 25 in Houston, Thunder-Rockets Game 5. Davis issued double technicals to Beverley and Russell Westbrook for “arguing” (trash talking) in the 4th quarter. It would be difficult to believe that the NBA isn’t keeping tabs on these developments, and possibly even on Davis himself, given the infamous inbound play from last year’s Thunder-Spurs series and the ensuing public scrutiny of Davis, who was the official right on top of three obvious inbound violations. That got the attention of everyone who follows the league or watches sports news, as well as a statement from the league acknowledging that the game officials had blown the call. Okay, so surveys involving players such as the LA Times survey don’t matter. Davis having called the only technical fouls (six in all) in his last four games, however, seems like the sort of data that can’t be ignored, in particular the technicals issued in Milwaukee and Houston, where the crowds were already riled up over Davis’ calls and non-calls when Davis called the Ts. The decision not to give Markieff Morris a technical foul (flagrant 1) after throwing Al Horford into the sideline area also seems like the sort of thing the league office would take note of. It is possible that only geeks who study referee data at basketball-reference.com are aware of Davis’ visiting team .540 win-loss record, or that Danny Crawford is the living embodiment of the league averages — but this doesn’t seem likely. The existence online of analytical stat pages for each referee is a sure sign that this writer is not the only NBA geek who has ever looked at them (I didn’t know those pages existed until last week). The NBA, apparently, does not. The league announced on March 2 a number of new initiatives, including expansion of officiating staff over the next three years, an Officiating Advisory Council, a new scheduling system to “optimize the chemistry and composition of crews”, and “the use of a new data-driven review system”, among other things. The review system will “create objective referee measurement standards and track progress regarding call accuracy and errors per game over multiple seasons” — which is to say, whatever the NBA does now probably doesn’t track progress or trends such as Davis’ visiting team win rate over time. Whatever the NBA does now in the 2017 playoffs isn’t exactly clear, but they do mention the use of “analytical data” in the playoff referee selection process. The questions begged here are whether or not the NBA assigns refs to playoff games randomly or whether there is a thought process involved in, for example, sending Davis to Houston for Game 5 of the Rockets series with Russell Westbrook and the Thunder, OKC facing elimination on the road. And if there is a thought process in place, what is it? It’s obvious that Davis is not worried at all about incurring the wrath of a home crowd or going head to head with a star player — this much was evident in Houston on Friday and in Milwaukee April 27. If it’s not random, and there is a thought process involved in making the officials’ assignments, do we really want to know why — with the Bucks needing to win to stay alive in the playoffs — the official who was the bane of home teams this season was assigned to referee a Game 6 in Milwaukee? Note: As of games through Wednesday May 10, including Wizards-Celtics Game 5 in Boston, neither Crawford or Davis has worked another game since Game 3 in Houston May 5. Forte was 4th “alternate official” for one game. The officiating pool will be cut from 30 to 20 after the semifinals round. This post has been edited to include notes about the NBA’s new officiating initiatives announced in March. Source for player stats, regular season and playoff averages is basketball-reference.com. Sources for game play-by-play data are the Official Scorer’s Reports posted at NBA.com at bottom of AP recaps. This entry was posted in Essential Reading, More than a Slap on the Wrist - series on playoff officiating, NBA Playoffs and tagged 2017 NBA playoffs, Houston Rockets, James Harden, Kawhi Leonard, LA Times NBA survey, NBA Official, NBA official Marc Davis, NBA Officiating Initiatives, NBA referee Brian Forte, NBA referee Dan Crawford, NBA referees, Patrick Beverley, Patty Mills, Pau Gasol, referee Marc Davis, San Antonio Spurs, Tony Parker on May 8, 2017 by J.D. Mo.